The Oil Search Foundation’s small grants scheme is helping to make a difference in communities to address social issues, particularly violence against women and girls in Papua New Guinea. The Foundation’s Women’s Protection and Empowerment (WPE) program started the initiative early this year to support community members and Oil Search staff to develop projects that are culturally relevant. Oil Search Foundation’s Head of Expansion Programs, Jean Martin said Oil Search staff come from a broad range of backgrounds and the skills, knowledge and tools they gain at work are shared when they return to their communities. The scheme was advertised in 2016 and 29 people applied. The applications represent a range of community and staff led initiatives. The Foundation awarded ten grants ranging from K2300 - K4000 to ten successful applicants for activities in Jiwaka, Hela, Southern Highlands and Port Moresby. Oil Search Foundation’s Hela Provincial Development Manager, Gorithie Tai is one successful applicant from Jiwaka. Since 2013 she has been the major sponsor of her local rugby team and has used the team to deliver HIV and gender related awareness, education and advocacy in the community using her own resources. “The grant will help me continue to address issues targeting youth and men which are critical to our development as a community. I’m able to take the learnings from work at Oil Search to my own people including on how to address social issues, foster respect for women and girls and address the real issue of gender violence,” she stressed. 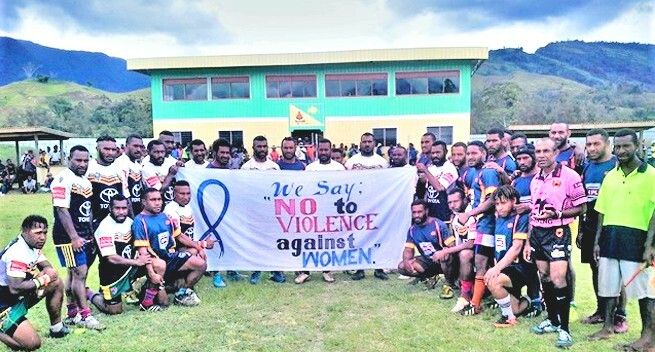 Gorithie has developed a program that the rugby team will use to campaign and spread awareness about gender based violence. The will speak as men to men about the importance of ending violence against women. The team will finish off by publicly pledging to continue to be advocates and change drivers to unite and eliminate violence against women. Charlie Kaipek a vibrant campaigner in the team said women are an integral partner at all levels in society to deliver development outcomes. Other grants include one staff using the local rugby competition to raise awareness on violence in Magarima and another who will be conducting first aid training for mothers in his village in Kutubu Southern Highlands. The small grants scheme will continue next year as a means to increase and maintain community conversations beyond the boundaries of Oil Search and across PNG.